In the allotment right now it is the apple season, with plenty of fruit coming from our minarette fruit trees. 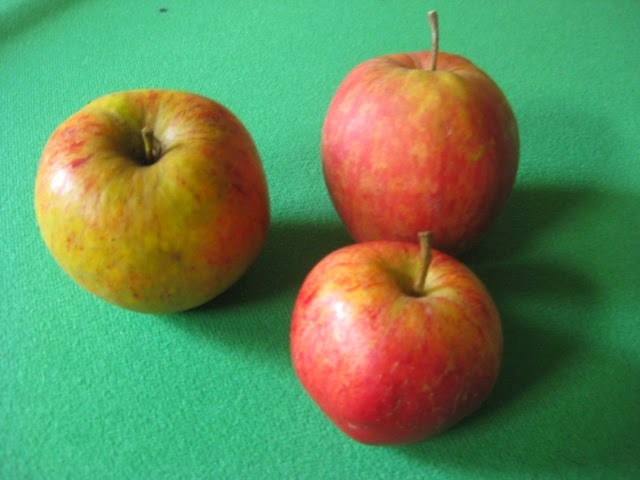 These particular varieties are in adjacent groups for fertilization purposes, the Gala and Chivers Delight being Group 4, the Falstaff being Group 3 (although self-fertile itself). The Gala and Chivers Delight are too close together for comfort now and the lack of light, despite pruning and training, has meant some black spot fungus and downy mildew, particularly on the Chivers Delight. The latter is going to be moved across to the other side of the fruit area so that it is not suffering by being too close to the Gala and the nearby damson minarette tree.